← Dairy Linked to 3 Deaths, Miscarriage, and that’s from PASTEURIZED dairy! It reached the cutting table – a bacteria watershed, where the cow is cut into different types of beef, including “trim,” the odds and ends that become hamburger. The E. coli went undetected in the 325 grams of beef trim tested from this particular 2,000-pound batch, so it moved through. When alarms sounded, it was in stores. 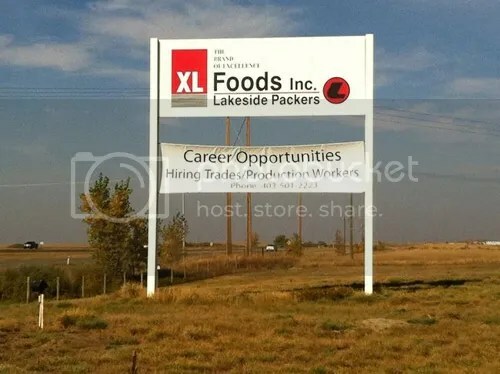 s Ottawa eyes changes to food safety programs, the Canadian Food Inspection Agency is seeking the cause of an E. coli outbreak at XL Foods in Brooks, Alta. There wasn’t one massive failure, but tiny ones that added up. Officials say the system worked, more or less, but couldn’t stop it. “That super-shedder that we had way upstream got through all those hoops and hurdles, and looked clean, [but] had just enough E. coli to basically get there [undetected],” CFIA meat programs director Richard Arsenault says. The CFIA says the company failed in “trend analysis,” or connecting the dots of tests that showed E. coli in discarded batches, but questions remain. Testing may need improvement. Cross contamination, particularly at an Edmonton Costco store, made things worse. The union that represents workers at the facility has said the production line moves too fast and the hot water for washing surfaces once failed. Messages left for company executives and spokesmen were not returned on Monday. The XL Foods plant is one of the three largest slaughterhouses in Canada; many smaller producers buy killed, skinned and cleaned carcasses from there. It was at another plant – the CFIA won’t say which – that testing on beef trim came back positive for E. coli on Sept. 4. The plant had got the carcass from XL Foods. A day earlier, U.S. officials found E. coli in an XL shipment at the border. CFIA officials swarmed the Brooks plant trying to figure out what went wrong. But they still let it operate, thinking it was a one-off. People were already getting sick. The recall began Sept. 16, and the shutdown was announced Sept. 27. If CFIA kept their agents focused on food safety in these plants INSTEAD of off with their legions assembled on Montana Jones’ small farm to kill HEALTHY heritage sheep (none of which have ever shown scrapie AT HER FARM) they’d have the man power they need to make sure the food that comes out of these plants is safe. They squash small famers and turn a blind eye for days and allow a BIG ag company to keep processing, short handed and over worked, because their intention is to promote BIG agriculture interests while squashing the small farming industry. Follow the money. If nine people have been ill from e.coli 0157:H7 but only four have been tied to the meat by genetic testing, what are the other five sick from? Why doesn’t the reporter ask this question? Is there some other contaminated food making the rounds in Alberta? I heard on CBC news that there are 46 CFIA employees permanently stationed in this plant, for the express purpose of preventing pathogenic meat from reaching the market, yet the meat inspectors’ union has the gall to blame the company. Outrageous! Another story says that a child who ate a burger on Labour Day weekend was taken to the hospital on September 11. That means the kid was sick for at least 8 days before anyone took her to hospital. She had kidney failure and had to have surgery. What would that child’s outcome have been, I wonder, had her family kept food-grade activated charcoal in their home and administered it at the first sign of vomiting? Why does nobody ever talk about the things that people can do in their own homes to counteract possible food poisoning? I suspect that none of this is really about an ecoli outbreak. It is about bankrupting ranchers to remove them from the land. This is the times we now live in. Why not just stop putting e. coli O157:H7 into the environment so that nothing would ever be contaminated by it? Looked like it was finally going to be a great year to be in the cattle business but true to their shady past our big packers stomp on producers once again. They’ll fill their lots with cheap cattle that will be ready just as the American market will be at it’s peak. And they wonder why our cow herd is shrinking and ranchers are getting out of the business??? ?